[social_buttons]A Colorado company has unveiled what they call the highest performance, lowest cost utility-scale solar power system of any kind for generating electricity. 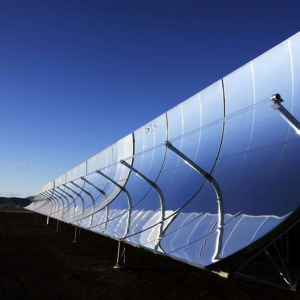 The SkyTrough, by SkyFuel cuts the cost of its parabolic trough concentrator by 35% compared to other commercially available systems, largely because of a mirrored polymer which replaces the heavy glass used in other solar parabolic trough collectors. Developed in a research partnership with the National Renewable Energy Laboratory and the University of New Mexico, the SkyFuel’s new design is 375 feet long, twenty feet tall, and features the largest parabolic trough modules ever built. The trough has several critical innovations that improve performance and significantly reduce cost. The most notable of these improvements is the use of a proprietary silvered-polymer film, which is a low-cost, highly reflective and shatterproof alternative to the expensive, heavy and fragile curved-glass mirrors. In the SkyTrough, the proprietary ReflecTech Mirror Film is laminated to thin aluminum sheets to form light-weight, yet highly accurate mirror panels. This allows for larger and fewer panel segments than in previous trough designs that still use curved glass. The film cuts mirror costs by approximately 50 percent compared to the price of using glass. The film is also easily manufactured at high volume thus eliminating one of the bottlenecks that has slowed the deployment of other solar power systems. In addition to being less expensive to manufacture, the light weight of the silvered-polymer film also cuts down significantly on transportation costs. All ready-to-assemble components of the 375-foot long trough will fit onto one flat bed truck, an important advantage with transportation fuel costs on the rise. The company expects to have an installation of its SkyFuel system in the next year. If all goes well with those 2 – 10 megawatt pilots, the company will scale-up with larger projects. Image credits: 1&2. Tim Hurst; 3. SkyFuel Inc.